We have upgraded the Tax Rate user interface to make it easier to add and manage different tax rates on one selection panel. To add a tax rate to your invoice, you will no longer access a drop down menu. 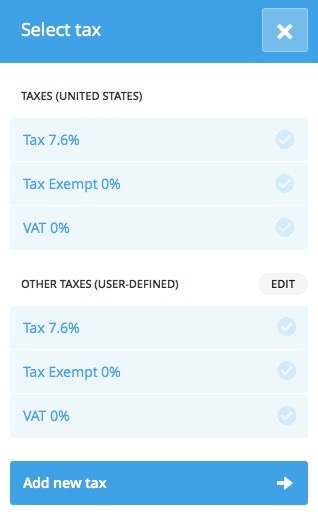 If you click into the Tax % field, a new selection panel will appear on the right hand side of the screen with a list of tax rates to choose. Clicking a tax rate from the list will immediately populate the Tax % field. From now on, you will add and manage all your tax rates from the Select Tax screen. To learn more about editing and adding new tax rates, please refer to documentation here.